In October of 2015, the EPA released the 2017-2022 strategic plan for its Sustainable Materials Management Program. This document laid out three areas of priority on which the EPA would focus its materials-management efforts over those five years. Two of these subjects of focus will be familiar to policy-makers and sustainability advocates already: food waste and packaging. The third might not be such a household issue currently. Although, as we will explain, it is enjoying a welcome resurgence. Help communities devastated by natural disasters manage debris through data tracking, better planning, and new building codes. Create data-tracking and analysis systems to measure handling of construction and demolition (C&D) materials and other industrial byproducts. Bring the concept of lifecycle-based materials management to the world of C&D materials through greater reuse and recycling of these materials. These are no small changes the EPA and its partners are working on. According to EPA figures from 2014, U.S. households and businesses generated 258 million tons of municipal solid waste that year. The construction and demolition industries generated 534 million tons of waste. These figures alone explain why managing waste in the built environment is an EPA priority, and public awareness about recycling and reusing C&D materials is on the rise. 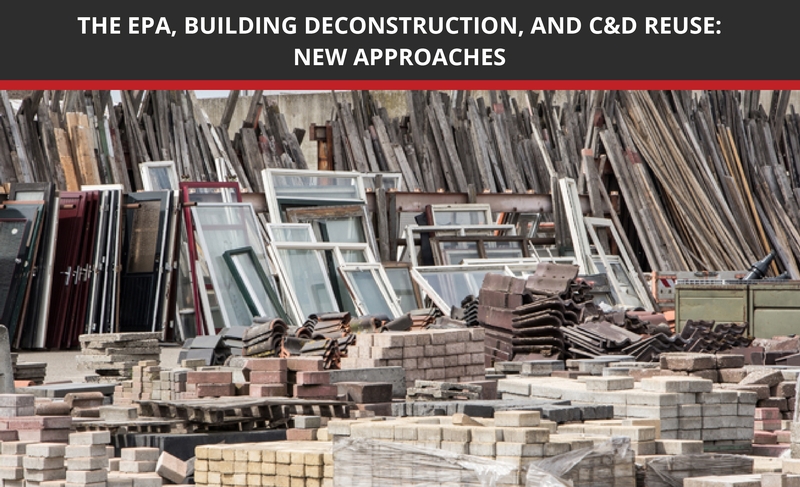 If you're a municipal policy-maker wondering about deconstruction programs, a contractor looking to get into this growing market, or any other stakeholder interested in better ways to handle C&D materials, this overview of building deconstruction is for you. The Ongoing History of Building Deconstruction in the U.S. The practice of deconstructing human-built structures to reuse their materials probably dates back to the second building on the planet. But in the United States, the latest iteration of the practice started to come into its own around the turn of the millenium. Deconstruction is the systematic disassembly of buildings in order to reuse and recycle as many of the component parts as possible, before or instead of standard mechanized demolition. While that definition still holds today, growth in municipal investment in deconstruction programs has generally lagged in favor of C&D recycling programs. To be clear: Recycling of C&D materials is more sustainable than landfilling tons of lumber. But reusing these resources provides even greater environmental benefits like sequestering carbon and reducing the demand for new-cut lumber. Still, for years, C&D recycling got more legislative attention than deconstruction for reuse. Local governments, like Santa Monica, San Jose and San Francisco, have developed new rules that require C&D discard recycling. Rules include bonds to get permits, which are then repaid when the project manager proves that certain percentages of materials have been recycled. No local ordinance however, as yet, rewards deconstruction over C&D recycling. Today, Seldman has reason to be hopeful. In 2016, the city of Portland passed the nation's first ordinance that requires certain classes of properties to be deconstructed. The city established a Deconstruction Advisory Group in 2015, and requirements went into effect in October of the following year, explained Shawn Wood, construction waste specialist for the Portland Bureau of Planning and Sustainability, in an EPA webinar. In the program's first year of existence, the city trained more than 30 new workers in the field and awarded 17 certificates to deconstruction contractors, Wood said in the webinar. In the same timespan, these workers salvaged 70 percent of the materials in the homes they worked on, generating 5 million tons of sought-after construction goods, including valuable old-growth lumber. Which Buildings Are Good Candidates for Deconstruction? The goal of deconstruction is in line with the EPA's 2003 policy document Beyond RCRA: Prospects for Waste and Materials Management in the year 2020. That document marked a shift in the Agency's implementation of the 1976 law, the Resource Conservation and Recovery Act. Rather than focusing on waste management, the EPA would now shift to a materials management paradigm. In other words, there is no waste, not ideally: There are only materials that we can leave in place, reuse, or recycle. Of course, today's communities are a long way from the zero-waste ideal. You can't repackage spent nuclear rods or toxic sludge, to use extreme examples. But as Portland's deconstruction ordinance proves, we're still wasting a lot of valuable materials that could be carefully repackaged and resold. Nicole Tai is the founder of GreenLynx, a Bay-Area deconstruction outfit and reseller. She recommends that deconstruction crews keep three priorities: Preserve furniture-grade lumber, capture bulk fir wood for manufacturing new homes, and save any parts of the home that are durable and historic — because these are the things for which there's already a market. Since reclaimed wood is such a valuable material, wood-framed buildings are best. Heirloom woods like American Chestnut, old-growth Southern Yellow pine, and Douglas fir are particularly valuable. As an added bonus, they tend to come from a time when builders simply nailed boards together — no industrial adhesives, the bane of every deconstruction crew member. Though older buildings can bear more valuable materials, the more structurally sound the unit is, the better. Decaying materials don't have resale value. Buildings with architectural salvage items are also great choices for some level of deconstruction. There are robust markets for antique flooring, moldings, and even doors, doorknobs, and hinges. Undamaged bricks also make great resale items, and wooden houses with old brick bases are great for deconstruction. Even some buildings that don't meet many of these criteria often yield valuable materials with partial deconstructed before the wrecking balls move in. But financial value is far from the only benefit that deconstruction offers compared to traditional demolition. In 2007, recycling C&D materials created 230,000 jobs nationwide, according to the EPA's 2016 Recycling Economic Information Report. According to Tai, deconstruction crews require around 5 more workers per 1,000 feet than comparable demolition jobs. When you reuse existing materials, the virgin resource market should shrink. That means cutting down fewer trees and emitting fewer greenhouse gases in industrial production processes. Reduced risk of toxic pollution. Though the EPA suggests that, at the very least, demolitions teams hose down older buildings to prevent the spread of lead dust, they don't always follow through. Careful, beam-by-beam deconstruction won't send a cloud of lead dust or other toxins into the neighborhood. Trees absorb carbon dioxide throughout their lifespans and hold that carbon within their cells, even when converted into timber. If the timber decays or burns, the greenhouse gas floats into the atmosphere. If you're interested in starting deconstruction programs in your municipality, or wish to expand a demolition business into deconstruction, there are plenty of resources available. Reach out to nonprofits like the Building Materials Reuse Association, the Reuse Alliance, or the Institute for Local Self-Reliance. You can also take the next step by finding EPA building deconstruction resources here. "Advancing Sustainable Materials Management: 2014 Fact Sheet." EPA. U.S. Environmental Protection Agency, Nov. 2016. PDF. 29 May 2018. "Analysis of the Life Cycle Impacts and Potential for Avoided impacts Associated with Single-Family Homes." EPA. U.S. Environmental Protection Agency, Jul. 2016. PDF. 29 May 2018. "Best Practices for Reducing, Reusing, and Recycling Construction and Demolition Materials." EPA. U.S. Environmental Protection Agency, 23 Aug. 2017. Web. 29 May 2018. "EPA Sustainable Materials Management Program Strategic Plan for Fiscal Years 2017-2022." EPA. U.S. Environmental Protection Agency, Oct. 2015. PDF. 29 May 2018. "Fact Sheets on Designing for the Disassembly and Deconstruction of Buildings." EPA. U.S. Environmental Protection Agency, 29 Jun. 2017. Web. 29 May 2018. McPhee, Marnie. "Latest Trends in Deconstruction." Biocycle, vol. 43, no. 11, Nov. 2002, p. 28. EBSCOhost, 29 May 2018. "Recycling Economic Information (REI) Report." EPA. U.S. Environmental Protection Agency, 31 Jan. 2018. Web. 29 May 2018. "Reuse and Recycling Opportunities and Demolition." EPA. U.S. Environmental Protection Agency, 17 Apr. 2018. Web. 29 May 2018. Seldman, Neil. "The Evolution of Deconstruction." Biocycle, no. 6, 2009, p. 22. EBSCOhost, 29 May 2018. "Sustainable Management of Construction and Demolition Materials." EPA. U.S. Environmental Protection Agency, 9 Feb. 2018. 29 May 2018. "Sustainable Materials Management (SMM) Web Academy Webinar: Deconstruction and Building Materials Reuse — Innovations and Opportunities." EPA. U.S. Environmental Protection Agency, 19 Apr. 2018. Web. 29 May 2018. Tai, Nicole. "Deconstruction and Building Materials Reuse — Innovations and Opportunities — EPA Webinar Slides." EPA. U.S. Environmental Protection Agency, 19 Apr. 2018. PDF. 29 May 2018. Wood, Shawn. "Deconstruction Program, City of Portland, Oregon — EPA Webinar Slides." EPA. U.S. Environmental Protection Agency, 19 Apr. 2018. PDF. 29 May 2018.